Someone’s thrash is another one’s treasure – this old saying has an entirely different meaning for an octopus. The little guy found a beer bottle on the seafloor, and it’s just big enough that it can squeeze in and out – though why you would want to come out of a beer bottle after you got inside is beyond me. 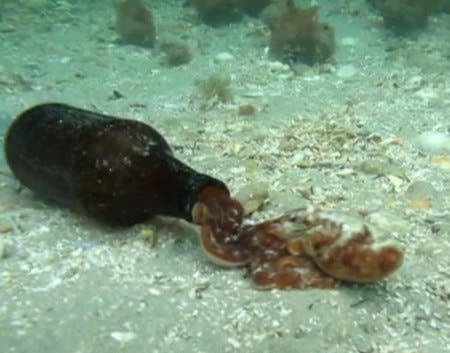 Science blogger Mike Lisieski took this footage about two months ago; the video showcases how octopuses can manouver themselves through tight spaces, whenever they are trying to get rid of predators, of even hunting. As a matter of fact, it’s a common practice for aquariums with octopuses to arrange mazes for them, putting up food prizes, to keep their brains entertained while in captivity.